Published recently in the Huffington Post Tenzin Dorjee: 5 Reasons to be Hopeful for Tibet lays out five seemingly plausible reasons for Tibetans and their supporters to be hopeful that one day Tibet will gain its independence. Dorjee begins by pointing to the contagious nature freedom. Not to split hairs or anything but freedom itself is not contagious; rather it is a desire common to all people and even animals. What does become contagious is emotion and rebellion; humans are emboldened by the bravery of others. Two or more people gathered together speaking the truth that everyone knows but is afraid to say, spreads courage and inspires others to move beyond fear based paralysis. There is an intense emotional connection that occurs when we speak the forbidden truth. Like a release valve this refusal to play the game frees up emotional energy and like a wave sweeps across a repressed community like a wild-fire. It is the emotion behind activism that becomes the real contagion. In this emotional condition things can go horribly wrong or wonderfully right. This is where trained activists and level-headed individuals are vital in directing the power of collective human emotion. Both Gandhi and MLK displayed excellent leadership by directing intensely emotional conditions away from explosive volatility toward a finely focused use of human energy. This is key in any social movement. We saw this during the Arab spring as well. What appeared as spontaneous combustion was actually a well-managed use of human emotion long kept in check by totalitarianism. Yes it spread because people wanted freedom, but is was able to spread and given life to spread because a group of people were willing to step out of the safety zone, and risk their lives for the truth. Once the fire is ignited the tactics of activism become all important. Non cooperation, boycotting, subversion and most importantly persistence all play vital roles in forward momentum. Some of these components of successful social movements appear to be taking place in Tibet. The self immolation's while at first shocking and confusing have been instrumental in waking up not only the Tibetan populace in Tibet, but the diaspora as well. The men and women who have sacrificed their lives in this violent manner have spoken the truth during their last moments, some even left written or recorded messages behind clearly stating their desire for freedom and the return of His Holiness to Tibet. They have spoken of all the things Tibetans in Tibet know but have been too paralyzed by fear to speak of or act against en masse. An incredibly powerful aspect of activism in the 21st century is the digital age. Without cell phones and social media like Facebook and Twitter the Arab Spring would have been less contagious. Technology used to bypass state firewalls was also an important aspect of the success and survival of the movement. In Tibet the use of internet and cellular technology has delivered videos and pictures of the immolations and details on each person. Though China's Great Firewall is well-known and powerful, for the enterprising and dedicated soul there are always ways around its ability to censure and control information. This knowledge increases the courage of the activist as they come to realize what they have spent their lives fearing, is actually vulnerable. However, all that aside, the biggest problem for Tibet is the lack of cooperation from geopolitical forces. Where the entire world was watching the Arab Spring and demanding that the United States, Great Britain, the U.N. and others act on behalf of the people in the arab world obviously ready for democracy and freedom, Tibet does not have that backing. In recent years I've noticed an adoption of the hope that China will fail and thus Tibet will be free. As a result many Tibetans in the exiled community seem to rely on the eventual failure of China's government as a means to a free Tibet. And this is where Tenzin Dorjee ends his piece stating that totalitarianism is dead and that like many one party regimes in the past China is headed for its downfall. Dictatorships have certainly taken a beating in the past couple of years, but unfortunately they are still very much alive and well. Where one falls another rises or becomes stronger. Russia fell and eventually rose again not much different from its previous version. Mexico fell and today is rife with corruption, elitism and drug cartels. North Korea, Iran, Saudi Arabia, Burma, Vietnam, Turkmenistan, Uzbekistan and a handful of others continue to operate successfully as totalitarian regimes. It is dangerously naïve to believe that one day we will live in a world free of dictators and cruelty and that democracy as it's advertised by the U.S. and G.B. is the answer. Opposing forces are likely a continuing element in shaping the paths of humans. History clearly demonstrates that no regime lasts for ever, the nature of life is change and so we know that yes one day China's current government will transmute into something else. However it is far too idealistic to believe that if China falls Tibet will be free and all Tibetans can reunite and begin the process of reestablishing themselves as a free and independent nation. Believing this fallacy is one of the biggest mistakes currently being made by Tibetan activists. Not only is it a setup for eventual disappointment it is also a setup for failure. Should a major shift in China take place providing an opportunity to renegotiate Tibet's status within the framework of China's control, what would that look like? First of all China's economy and success is currently deeply tied with the economies of almost every nation on the planet. Unlike Russia forced into failure by tactics meted out by the Reagan administration in the 80's, China is an important trade partner across the globe. If China falls everyone takes an economic hit. It is unlikely therefore that China's biggest trade partners would allow a failure of that magnitude. However if for some reason the U.S. and its allies decided that China as an international player needed to go, just like Russia, China's demise would be imminent. At this point that scenario is unlikely. Even if China were to sink into a depression of enormous proportion would they be willing to let go of Tibet and the immense military and tourist infrastructure established there? Would they be willing to let go of control of half the world's water supply and thus their own survival? No matter how accurate your oracle, the future is largely unpredictable, and so we can only guess based on the facts. And based on the current trajectory of geopolitical relationships across the globe it's highly unlikely that China will ever be forced to consider the aforementioned possibilities. One rational hope for Tibet is that the citizens of China will rise up against the one party system and demand the adoption of democratic governance. A wiser use of Tibetan activists energy would be in generating support for democracy among China's huge populace. Demands for Tibetan Independence like the Middle Way Approach have led to zero success with the Chinese government. Maybe it's time for a completely new plan that all Tibetans can support. 'Free Tibet' has become a tired meme that most people ignore because they've heard for years. And in a world facing much bigger issues than the fate of 6 million Tibetans, Tibet is largely invisible. Those of us who have supported Tibetan independence for decades may not like hearing this, but if we want to see change we have to see reality; and our tactics must change with the times. How does Tibet's fate impact the average citizen across the globe? Why should anyone care about Tibet? Repeatedly I have found that Tibetans are generally not the least bit realistic when it comes to considering or even answering these simple but important questions. Partly because they are far too close to the issue and have lost perspective or maybe they never had it in the first place. Yes there are good things happening in the Tibetan movement, Lhakar being one of my personal favorites. And while I am not a supporter of immolations I do see how they have incited more action in the Tibetan community across the globe, but the loss of life is not the answer to Tibet's situation. In reality the continuation of the debate between Middle Way and Independence is completely pointless. Both should be relegated to the scrap heap and a new path that considers the realities of the world carved out. It's time for change and that change begins with a reality check for Tibetans in a position to consider the bigger picture. It begins with the willingness to admit the current trajectory has failed and to analyze the reasons why. Change begins when we face the truth and begin again with a new path based on reality not hope. 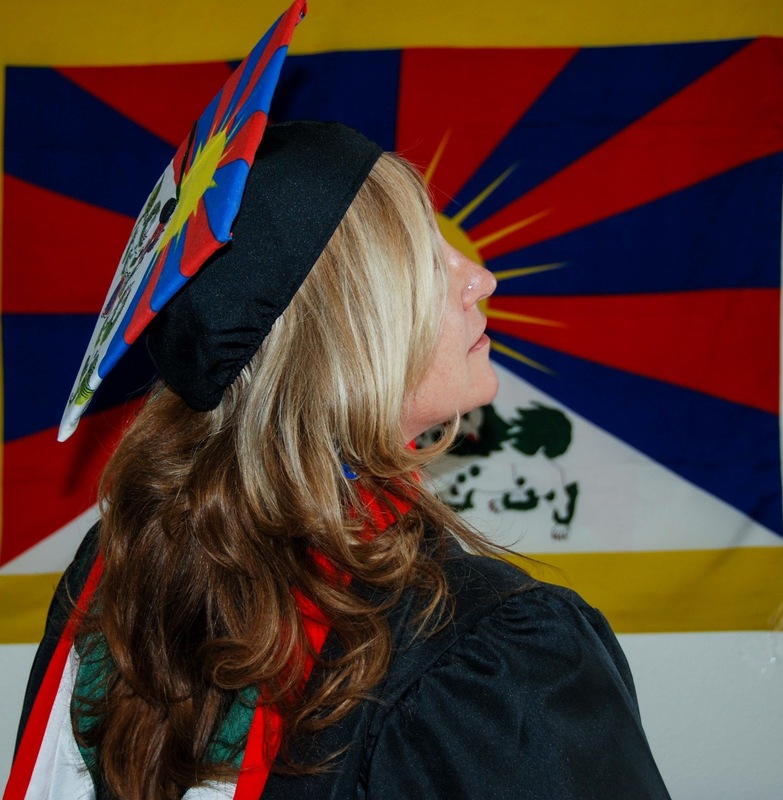 Editor's NOTE--Rebecca Orton is a writer, photographer, and historian of modern Tibetan history and long time supporter of Tibetans across the globe. She holds a Masters degree in Communication and is currently writing two books, one chronicling her experiences while living in Dharamasla, the second a coauthored project with Lakpa Ghale. The Tibetan Motorcycle Diaries, shares Lakpa's Free Tibet World Tour adventure. Rebecca created and regularly contributes to the Tibet’s Truth blog providing political analysis and news. She lives in Seattle, WA on the shores of the Puget Sound. I second with the author, and I personally believe 'yes', we have to have a new method, new demand which doesn't create division between middle way followers and independence followers, which can be a solution to cries of Tibetan people inside Tibet. In short, which can favourably end the ongoing self-immolations inside Tibet. Yes, now if we can just get the CTA and diaspora to have a productive honest conversation! Emotion should not be considered to versus rational but emotion can be used to bring unity! Right!!! Passionate unity is desperately needed right now, no more arguing about Independence versus Middle way. Completely pointless. One of the best reads in last few weeks. Thanks to the author! A misguided hope may lead Tibetans to an empty end!So,we must find the way to put the tibetan issue on table rather than putting in black and white and see what others feel.Emotion and sure,the self immolation ,may be a spark for a new revolution ,but it is ,in most of the times ,a outset for a new way to control and censure in the tibetan areas in china. Death can not find the solution but the consolation or condolence and so the misguided hope ! Agreed, death is not the solution to the problems Tibetans face. Honest dialogue, being smart about geopolitics and understanding the infrastructure of how to mobilize real and effective change will be instrumental in making headway with Tibet versus China. we need to build a tibetan society which is as strong as our monasteries but aimed at advancement and development rather then religion. it is what we need in this juncture ,when we talk about a nation,religion must hold no place! I have to agree with your point to "see and speak reality". If you speak of hope and are not able to see reality then hope is counterproductive. It is hope in the face of reality that helps to shift things. You are on to something there! This article really defines the power of word itself makes a different in the political sense. I am also focusing this word for long been where i always have quarrel an debated with. thanks for the kind consideration! But at the same time it would be helpful if analyse on what are the most effective, fast and reliable solution carried by theTibetan? other then boycott! Debates that become quarrels are counterproductive aren't they? We all can become so emotional about the things we are passionate about and unfortunately we then stop hearing each other. As far as analysis of the most effective solutions for Tibet, I think we need a Think Tank of qualified individuals to get the bottom of the issue and come up with a realistic strategy. It will not come easy and will take time, change is always slow. And Tibetans and their supporters need to be unified in their purpose and end goal. There can be no more division as there is now. The past 53 years have been wasted on opposing viewpoints that aren't backed by effective strategy. That needs to change now. So all these above who to Blamed? Nobody tries to lead the march as it needed at; and no one wants to initiate what is really good for Tibet. How can we can formed a think tank as society where we living is far reaching each other easily? Your strategies and any plannings? You raise a good point. Orgainizing between Tibetans in and outside Tibet is challenging, but may not be so impossible. As far as what's good for Tibet, I'm not sure there is agreement at this point on what that 'good" is, and that is an important piece of this puzzle. There is no real direction or unity right now in the exiled community though it seems apparent from the actions inside Tibet that people want freedom. But at this point can we truly define what that freedom looks like to them? Since there are nearly 6 million Tibetans still living under Chinese rule and less than 150,000 in exile; it seems knowing exactly what Tibetans in Tibet want for sure is a crucial part of the equation. As for Think tanks....An effective one would involve lots of organizing, and also would include the expertise of people outside the Tibetan communities. Geopolotical analysts, social activists, historians, people deeply familiar with Chinese culture and government, and those who understand the layered componants of creating social movements and who are not Tibetan will be able to offer some much needed objectivity to the conversations already taking place amongst the exiled community. Finding the leverage points in China's current configuration of government and society is crucial in creating a a viable movement. Agian this goes back to beign realistic. There is much to be learned from Ghandi's work to free India, yet the British were far different than are the Chinese, that fact further complcates the Tibet issue. There is an old saying that says "keep your friends close and your enemies closer". Understanding the Chinese government intimately, understanding their history with Tibet accurately and from all persectives, will likely reveal crucial leverage points that Tibetan's can use to build a case and a movement. Work within the system to get what you ulitimately want. I'll write more about this for a later article. Thanks for your questions and comments. i am so pleased to read some of things which i really like is "keep your friends close and your enemies closer" and more things that is sure to help the present scenario of Tibetan. You also mentioned some good points on system and culture where socialize have to mingle with it; and culture, tradition, religion and language as it will not be strong exist as it is not in own country. If Tibet waits for change in China; Tibet will be left on the empty space and no resources. It could be like missing most of major organs of a body. So what could be left for Tibet and Tibetan? I could be misjudging. The critical time of Tibetan in and the age relevant sophisticated issues of H.H the Dalai Lama's long life is always have respected and worried by 6 million Tibetan and the supporters. The Time is important especially in this century, and with it people have to survive. What I mean to say is Tibet needs some thousand people who are ready to returned Tibet in any means of manner with full international rule of law to recommend the truth. Then China will do his work and role of keeping peace in the world. Tibetan who are there in participating are demanding for their rights of land and freedom of individual liberty in their own place of forefathers land passed on them. It might take some time for exile Tibetan to reach that goal but it’s a most possible for Tibet and soon is most urgent. I hope we won't regret the changes. If Tibetans in exile not willingly to leave the exile country then why exile dramatize solidarity with Tibetans who always true in heart for the country and their leader. The neither an end, nor we have good life nor there have good life. The technical point is exilen to Tibet is Tibet for me. I am happy to read your wonderful analyzed on the comment. Thanks! What can we expect from Think Tanks? We have Tibet Policy Institute led by Thunten Samphel, former spokesperson of Tibetan government in exile, but we can see what and how they are doing? So, I wonder what we can expect from the Think Tanks. Better we suggest to reform the Think Tanks that which we have right now, but I am bit hopeless that we ever can have an unbiased, and highly qualified Think Tank--thats how works in Tibetan society, and thats the point which pulls our legs down! are you currently'll be faced with the insurmountable debt in the event you're not careful. basis, expenses are up like 15%, and now there's more -- there's litigation cost inside and things such as that.